« Ordinary things, Day 1 (a little late). Lily the Pup. A dog of unknown lineage. Ordinary. But special to us. She smiles a lot when she sees us. 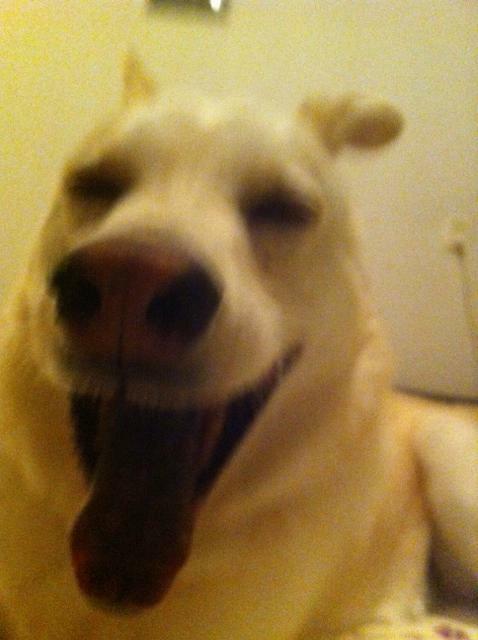 Here she appears to be laughing, but she’s yawning. This is what I get to see every day – her sweet face, funny purple tongue, I feel a lick or a nudge from her nose, and get an expectant look and a wagging tail. She’s independent, but still follows me all over the house. When my husband and I are in separate rooms, she positions herself somewhere in between. She loves her treats. She loves her toys. She loves us too, in her own doggy way. She sheds. A lot. She’s scratched floors, ruined seat belts and head rests. But it doesn’t matter. I miss her terribly when I’m away from her. It’s funny, isn’t it? A pet can make a huge difference – even an ordinary dog adopted from a shelter during a half off sale.